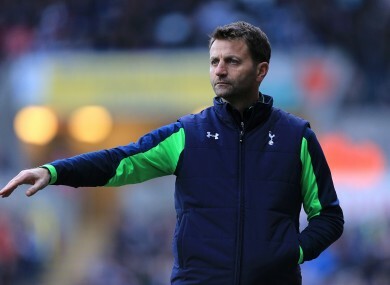 The former Tottenham boss can dust off his gilet as he returns to the dugout. TIM SHERWOOD HAS been appointed as the new manager of Aston Villa. The former Tottenham boss has signed a deal until the summer of 2018 and replaces Paul Lambert who was sacked last week. The ex-Spurs and Blackburn midfielder had been in the running for the QPR job after Harry Redknapp’s departure but talks broke down and the club has since appointed Chris Ramsey until the end of the campaign. With Lambert forced out of the Villa job three days ago though, Sherwood soon found himself in negotiations with the Midlands club in recent days. The Independent reported yesterday that the 46 year-old was the only candidate Villa had spoken to and that hoped to sign off on the deal over the weekend. Currently in the relegation zone, Sherwood’s appointment is a risk. He’s not used to relegation dog-fights and time is of the essence. But Villa want to build something long-term and believe Sherwood can oversee the development of young players and make some intelligent signings. Should they go down though, all of those plans will take a backseat. “While being forever conscious of the frustrations that we all suffer, we feel that a change that offers a positive, fresh approach will be very good for the club. Villa are in FA Cup action against Leicester tomorrow but Scott Marshall, first-team coach, will be in the dugout. Could this be Martin O’Neill’s next recruit for the Republic of Ireland? Email “Tim Sherwood is the new manager of Aston Villa ”. Feedback on “Tim Sherwood is the new manager of Aston Villa ”.